A caudex (plural: caudices) of a plant is a stem, but the term is also used to mean a rootstock and particularly a basal stem structure from which new growth arises. 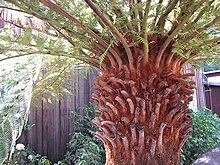 In the strict sense of the term, meaning a stem, "caudex" is most often used with plants that have a different stem morphology from the typical angiosperm dicotyledon stem: examples of this include palms, ferns, and cycads. The related term caudiciform, literally meaning stem-like, is sometimes used to mean pachycaul, thick-stemmed. The term is from the Latin caudex, a noun meaning "tree trunk". ^ a b Stearn, W.T. (1992). Botanical Latin: History, grammar, syntax, terminology and vocabulary, Fourth edition. David and Charles. ^ "caudex - definition of caudex by The Free Dictionary". Thefreedictionary.com. Retrieved 2014-07-15. 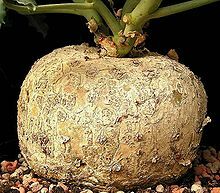 Look up caudex in Wiktionary, the free dictionary. Wikimedia Commons has media related to Caudices. This page was last edited on 27 August 2017, at 12:33 (UTC).